At Outsource2india our visual effects (VFX) artists push the limits of what is possible creatively and technically at the most competitive costs. 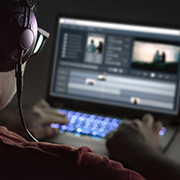 Whether you require a single VFX shot, the complete post production of your video, composition, blurring, animation, matte painting, rig removal, set extension or environment creation etc., we can handle any VFX need. We cater especially to the VFX needs of the advertising, entertainment, media industry, gaming and science and technology industries. Over the past two decades our creative team has assisted global clients with. Special Effects - We offer visual effects services for live action scenarios. Digital Effects (digital FX or FX) - We integrate still photography and CGI to create realistic environments. Matte paintings - This includes digital, traditional paintings or photographs which serve as background plates for 3D characters, particle effects, digital sets, and backgrounds. Modeling - We create 3D models of props or characters with specialised software. Animation - We assign movements for objects and characters in 2D or 3D. Compositing - We combine visual elements from different sources to create the illusion that all those elements are a part of the same scene. We also offer 3D compositing. This process involves matching the movement of the live action footage with a virtual camera. We use rotoscoping to remove elements from live-action footage or bring elements in for live action. Motion capture is used to match 3D character movements with live action character movements and roto paint to remove additional properties used on live motion capture matts. Select a frame(check) that has been filmed with a real live camera and tracking its motion so that 3D elements can be added to it. Develop a mathematical representation of any surface of an object (either inanimate or living) in three dimensions via specialized software. Create a skeleton for a 3D model, so it can move. Generate three-dimensional moving images in a digital environment. Using texture mapping to create a surface that resembles real life, by adding graphics to a polygon object. Creating artificial effects such as flashes, bangs, fog and smoke. Illuminating a scene or subject in the best possible way. Transferring a view on a 2D scene to a 3D image of that scene, according to the position of the view. Combining visual elements from separate sources into a single image to create the illusion that they are part of the same scene. 30+ team of qualified visualizers, designers, graphic artists, illustrators, etc. Outsource2india provided 3D animation and 3D modeling, and texturing, animatics and voice implementation services to world-renowned medical research company in Scandinavia. Make your videos stunning and memorable with a full range of visual special effects (VFX) services available from Outsource2india. Contact us, tell us your requirement, and we will give you a FREE quote within one business day. At Outsource2india we aim at optimizing business processes for a wide range of industry verticals and provide a spectrum of services including Data Management, Call Centre, Engineering services and more.